Prescription drugs are the leading source of drug addiction in the United States, with the CDC saying that prescription drug abuse has risen to epidemic levels. According to the Partnership for a Drug-Free World, 15 million people become addicted to prescription drugs each year, and 52 million people have abused prescription drugs at some point—6.5 million in the last month, according to the National Institute on Drug Abuse. This problem is a uniquely American one. The United States represents just 5% of the world's population but consumes 75% of its prescription drugs. A range of factors play a role in this: incredible affluence relative to other nations, a high rate of mental illness, and extremely stressful lifestyles. However, it is hard to underestimate the role of over-reliance on prescription drugs within the medical industry. Prescription drug marketing plays a key role, since it can encourage people to seek out drugs they do not need, according to the American Medical Association, which recently called for a ban on prescription drug advertising. Likewise, physician over-prescription of medication makes addiction more likely. In 2010, doctors prescribed enough prescription painkillers to medicate every American adult every four hours for a month, the National Institute on Drug Abuse reports. 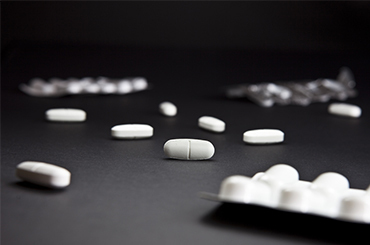 Believe it or not, prescription drug abuse can happen accidentally. This occurs when a doctor prescribes a potentially addictive drug and the patient grows dependent upon it. In some cases, patients find that the original dosage simply no longer works, and steadily up their dose, creating tolerance that ultimately leads to dependency. In other cases, a patient finds that when she no longer needs the drug, she experiences such intense withdrawal symptoms that she continues taking it. 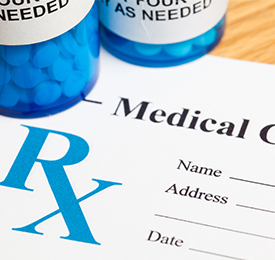 The CDC highlights the prominent role this plays in addiction, calling for increased physician attention to patient symptoms and to prescription-writing practices. Of course, not all people who abuse prescription drugs have a valid medical prescription. Because these drugs are highly accessible, the contents of a parent's medicine cabinet can serve as a gateway drug for teenagers. People looking for an easy high, rapid relief from psychological pain, or a good night's sleep may self-medicate by borrowing or stealing a loved one's prescription. It's possible to become addicted even under the watchful supervision of a caring physician, but people who use prescription drugs non-medically are more likely to become addicted than those with valid prescriptions, according to the National Institute on Drug Abuse. Your path to prescription drug addiction is unique. Treatment can help you understand the trajectory of prescription drug abuse may help you avoid becoming a victim and encourage you to get help if you've already fallen prey to this disease. Please call 1-888-993-3112Who Answers? to get help now. It's possible to have a valid medical prescription, follow your doctor's advice, and still be a prescription drug abuser. Some addicts occupy a gray zone of prescription drug abuse, and the reason for this is pretty simple: not all medical conditions manifest in a blood test or x-ray. Therefore, it is fairly easy to present “symptoms” or complaints to one’s doctor. Mental health conditions such as anxiety and insomnia, some chronic pain conditions, and a handful of other ailments are diagnosed based on symptoms. Some people lie about their symptoms to gain access to prescription drugs. Others self-diagnose to get drugs. For instance, a man who wants to stay up all night studying might tell his doctor he has symptoms of ADHD to get Ritalin. Alternatively, a woman who struggles with the normal concentration challenges we all periodically face might misdiagnose herself with ADHD. If her doctor does not carefully screen her for symptoms, she might end up with a potentially addictive prescription drug that she does not actually need. Her history of taking ADHD medications will then serve as evidence to future doctors that she needs these drugs! Doctors must be able to trust their patients, and requiring a patient to “prove” that he or she has a problem means that many who need medications might have to go without them. So while this strategy is unfair and needlessly burdensome, doctors must take proactive measures to ensure their patients take the right drugs—and nothing more. The CDC points to the power of brief counseling sessions, open communication, and an emphasis on controlling symptoms with the lowest dose possible to combat the epidemic. No matter how you come to abuse prescription drugs, the ultimate outcome is the same: chemical dependency. Chemical dependency occurs when your body thinks it “needs” drugs to function. Feeling jittery, depressed, anxious, or angry. Sweating, shaking, or unexplained coldness. Prescription drugs kill more people than any other drug group, claiming more than 22,000 lives in 2013, according to the CDC. If you are concerned that you may be an addict, seek help now to avoid becoming a statistic. Call 1-888-993-3112Who Answers? today. Using prescription drugs without a doctor's prescription, or at higher doses than recommended by your doctor. Lying to your doctor about your symptoms, or “doctor-shopping” to get multiple prescriptions. Experiencing difficult withdrawal symptoms when you attempt to quit using. Spending a significant portion of each day high on prescription drugs. Mixing multiple drugs to get a stronger effect. The single best way to avoid addiction to prescription drugs is to establish a strong relationship with a physician you trust. Be honest with your doctor, and don't take any prescription drugs that you don't need. The CDC suggests that doctors counsel their patients about the relative risks and benefits of prescription drug use, and that they emphasize the potentially addictive nature of prescription drugs. These brief counseling sessions can help patients be more mindful of the role prescription drugs play in their lives, in addition to offering patients a chance to disclose a past or current addiction to prescription medications.